REVIEW: WWE Clash of Champions 2017 DVD – One for Your Collection or Just a Sunday SmackDown? Clash of Champions 2017 didn’t feel like a particularly important card beforehand. 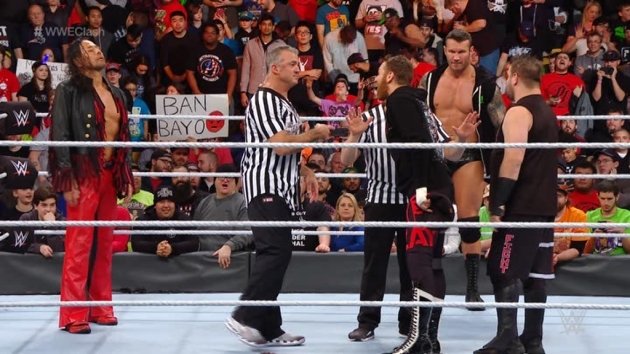 The ongoing feud between Shane McMahon and the alliance of Kevin Owens and Sami Zayn made for entertaining television, as well as creating tension between Shane and Daniel Bryan. However, their scheduled tag team clash with Randy Orton and Shinsuke Nakamura was inevitably going to be centered around the SmackDown authority figures (who were serving as co-referees) rather than the action itself, meaning that the match itself would seem secondary. Add to that the last gasp of Jinder Mahal’s main event push as he looked to regain the WWE Championship from AJ Styles, and a number of multi-man encounters for titles further down the card (along with the newly-promoted Riott Squad serving amongst the several lumberjacks for the latest battle between Charlotte and Natalya), and the PPV had a skippable feel to it. Indeed, it seemed so insignificant that fans I spoke to actually needed to be reminded that the show was even happening! Nevertheless, that’s what reviews like this one are for: to take a look back at PPVs of all kind on DVD, and to determine whether Clash of Champions has any more value as a Home Video release than it did when originally broadcast. So, let’s get started! I really enjoyed this opener. 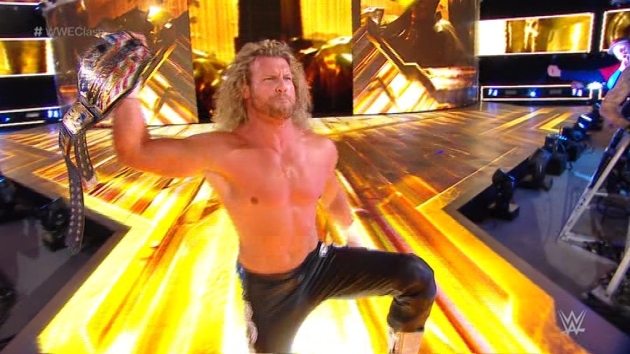 Ziggler winning the United States Championship was a surprise, though events since Clash have made me wonder why they didn’t just crown Bobby Roode as the new titleholder here. It’s still well worth watching, though the sudden title loss caps off a year of notable highs and extreme lows for Corbin. It was around this time that Rusev Day was becoming the latest unexpected success story, leading many to hope that Rusev and Aiden English would win the doubles titles here. Instead, The Usos would successfully retain, strangely pinning the team that would ultimately continue feuding with them into Royal Rumble. The match quality is fine. Charlotte and Natalya finally settled their long rivalry in this Lumberjack match. As it turned out, The Riott Squad (who had, erm, run riot on SmackDown’s women’s division in the preceding weeks) played a smaller role than I was expecting in this contest. The result is not a surprise, though I liked the tease of Carmella almost cashing in Money in the Bank. It has to happen soon, right? Nothing to see here, really: it’s a match that serves its purpose, but does little else. Look for Harper and Rowan to be SmackDown Tag Team Champions in the near future (perhaps as soon as Fast Lane?). Matches like this are enjoyable enough and do an important job of progressing storylines, but as the most promoted match on a PPV event, fans are expecting a greater emphasis on the in-ring action. The upshot is, the match is entertaining to watch, but once the Shane-Bryan-Owens-Zayn storyline comes to an end, you’ll probably forget that bouts like this even happened. Jinder Mahal said online after his WWE Title loss to AJ Styles in Manchester that his main event push was not “an experiment”. Yet that seems to be the most appropriate description of his headline adventures, and this did indeed prove to be his last hurrah in a featured spot, as AJ Styles retains his WWE Championship in a watchable but unmemorable main event. Jinder’s decline since November 7 has been so rapid that fans would be up in arms if it were for a more popular, talented performer. That few have noticed how WWE has hindered Jinder over the winter months summarizes how unsuccessful his WWE Title reign really was. “Unremarkable” is the best way I can describe Clash of Champions 2017, both at the time and unfortunately again here on DVD. None of the matches are actively bad, and the shorter matches (including Rawley vs. Ryder) serve their purpose of giving a boost to the winners. But it felt like a special episode of SmackDown Live, as opposed to an event of Pay-Per-View caliber. That has often been the case with December PPVs, which can feel inconsequential as WWE transitions between its autumn season and laying the groundwork for the Road To WrestleMania. As a result, shows like this tend to just happen because it’s that time of the month, rather than there being sufficient demand. At a time when WWE is slightly streamlining its PPV schedule, might it be a good idea to scrap December PPVs altogether, instead presenting a stacked episode for RAW and SmackDown to bridge the gap between Survivor Series and Royal Rumble? Anyway, Clash of Champions is not the worst WWE PPV of 2017, but it definitely feels like the least important supershow of last year. You’ll be rewarded with some decent action if you check it out again on DVD, but it’s unlikely you’ll remember most of the show when it’s all said and done. One for the die-hards and collectors only, in my opinion. – United States: RIGHT NOW! Get the CoC 2017 DVD ordered now here on Amazon.com. – UK/Europe: RIGHT NOW! Grab a copy of the CoC 2017 DVD now on Amazon.co.uk. – Australia: March 21st. Your pre-order opportunity is live for next month at Madman.com.au. Based on rumors going on looks like WWE might stop the brand exclusive PPVS starting with Backlash in May and all PPVs going forward will be dual brands. So Fastlane/Elimination Chamber Double Pack will likely be the last one. PPV events are not special anymore. The writing is poor. I picked up a nice copy of clash of champions from walmart in canada as today is the release day of it here, Now I own all b ppvs of 2017 which I never done before only big 4 ppv event I dont have is Summerslam because I felt short for it that time but I’ll get it ordered online thow some time soon. The main issue I have with this PPV now is the title of it, given that it is single-branded. The point of Night/Clash of Champions surely should be that every title in the company is defended, so it should be a co-branded PPV? Generally speaking, these Smackdown titles would be defended at almost all of the Smackdown PPVs anyway.